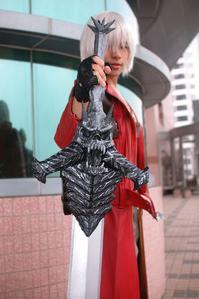 Dante’s Rebellion sword is sought after by many cosplay fans. In this tutorial, I’ll show you how I made my own Rebellion sword. With this tutorial, you will be able to make it personally. Today’s tutorial is how to make your very own Blizzard Elf eyebrows. 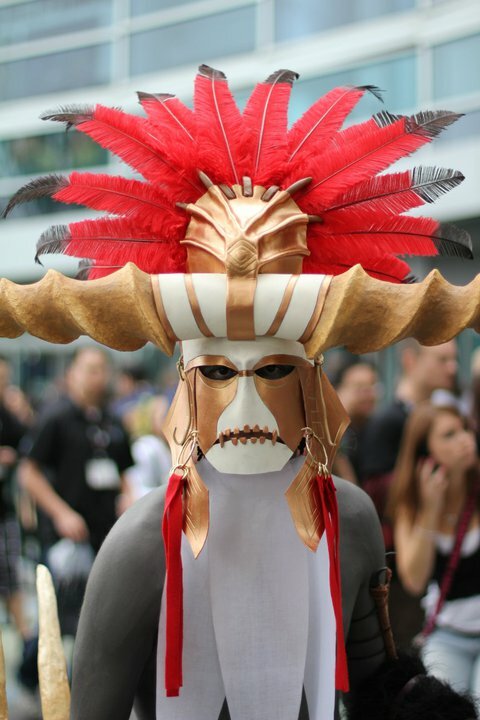 It’s one of the things that makes Warcraft elf cosplay stand out from the rest! They are super easy and simple. First things first, you will need the hair you will be using. If your using a wig cut a small piece of the hair from the bottom most layer. If your not using a wig, you COULD be brave and use your own hair, but I wouldn’t recommend it. Just go to your local dollar store or accessories store and get a cheap hair extension that matches your hair. Take the piece you cut and split it evenly into two. Now that the pieces are separated, cut them to the length you prefer. I like to have mine about 2 inches longer than my own eyebrows. With the excess pieces, cut a small piece that would would measure from the point of your eyebrow to the arch. This will make it thicker. Now take your glue and put it on the point of your eyebrow and on the center. Don’t put it on the end! This will make the end super clumpy and heavy. You want it to look thin. Take your fingers and smooth the glue out from the point to the center. Your hair will move around in your hands, don’t panic! Just try to keep the basic shape. You will have little hairs sticking out where they shouldn’t be, so trim them up so they are all neat and clean. Give them about 5 minutes to dry. Now take your scissors and trim the point, I like to have mine on a sharp angle. If your eyebrows have spaces in them like in this picture, make sure you fix them before the glue completely dries. Just push and pull the hairs til they cover the holes. And ta-da! You have your very own Blizzard Elf eyebrows! You can attach them to your face with eyelash glue, or spirit gum. What if you have super dark/bushy brows? Take some of the clear glue and smooth them down. Let them dry and cover them completely with your foundation til they arent visable. 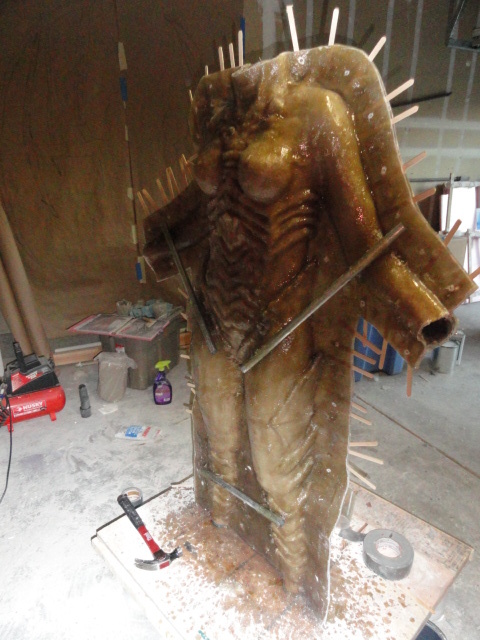 This weekend, Mario and I attached some steel rods for support so the fiberglass mold won’t warp (we’re likely adding on more later on) and unmolded Kerrigan. 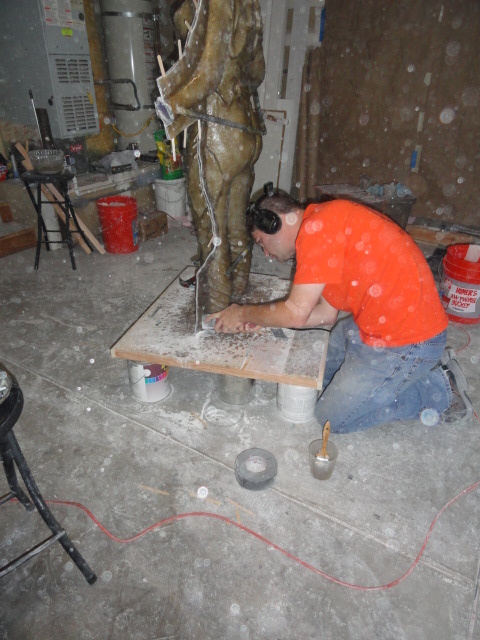 We started by first drilling holes around the mold for bolts to go in to, then inserted the bolts and secured them with wing nuts. Then Mario used a vibratory saw to clean up the edges so the edge of the mold would be cleaner, and finally we found a seam and started to gently pry open the mold by inserting a screwdriver, and then inserting popsicle sticks all the way around. 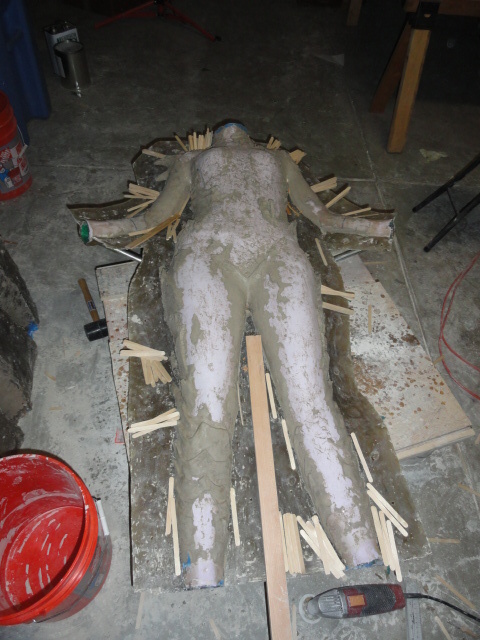 She was fiberglassed on to the board so we had to cut her off. The mold wasn’t damaged at all from this. 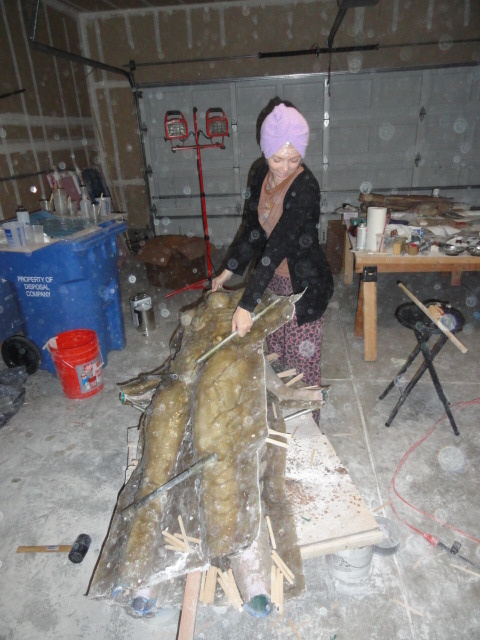 More on how we fully got the mold apart later, but here are some more pictures! I was going to do a weekly Kerrigan update, but then I realized that we’re so busy, some weeks go by that we only get a tiny bit of progress done, barely anything that’s worth mentioning on the blog, so I’ll update whenever I have more than one thing to show you guys. In case you were wondering… my (Alice’s) Blizzcon costume! 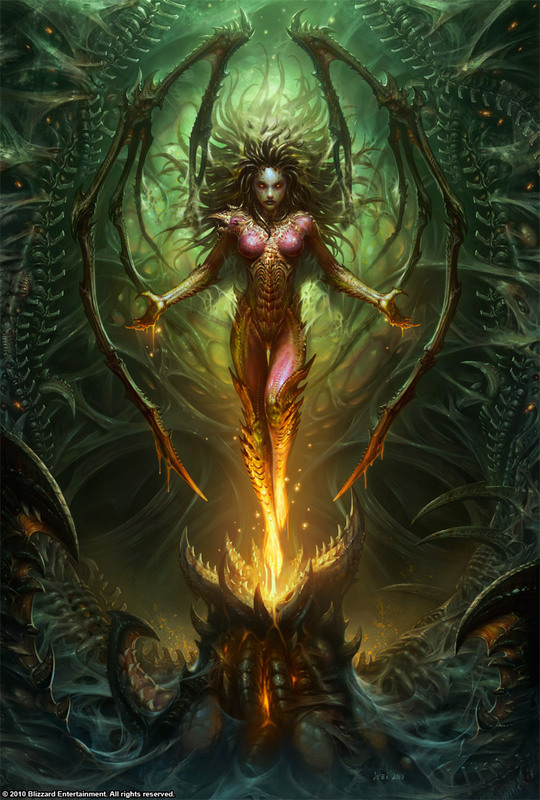 That’s right, people, I am going to be attending Blizzcon 2011 as Kerrigan, Queen of Blades! 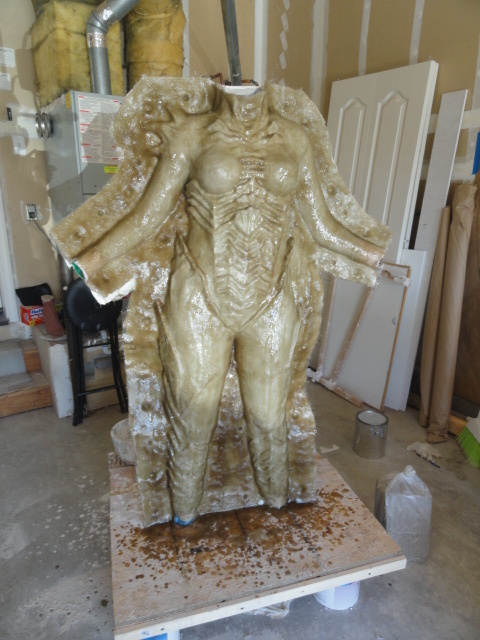 The costume is based on most of her more recent pictures; the wings will be similar in shape to the picture below, and thanks to Steve Wang uploading a ton of pictures of the making of the statue of her he did for Blizzard, I have an entire binder full of reference photos! I’ll be putting up a guide on how we’re making this, for sure, but not until after the costume is completely finished- I want to make sure the whole thing is complete before I start writing up tutorials for it. This is the current state of her! 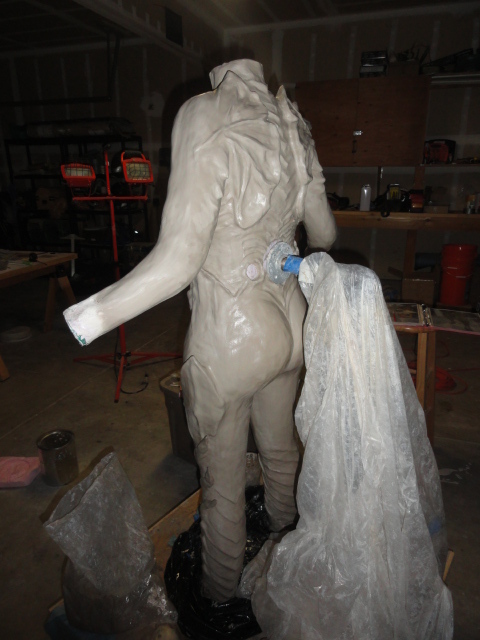 I was going to wait until both sides were fiberglassed and apart, but darn it, I’m too excited, and I wanted to announce it while everyone was still awake, since we’re not going to be done with glassing until late tonight! 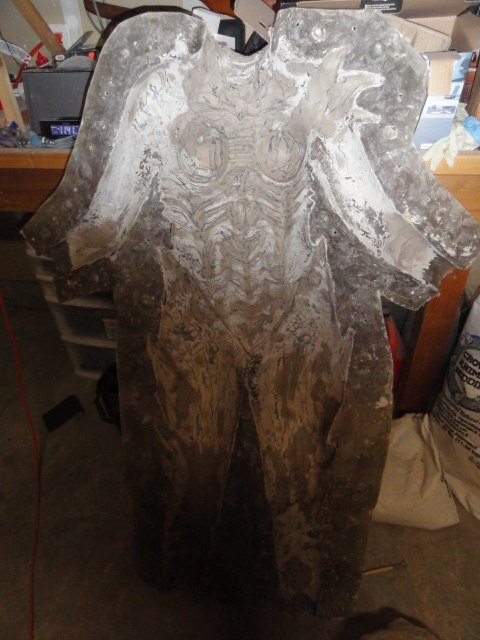 In case people are wondering, we’re planning on doing this as a full body suit, cast in foam latex. We’ve been planning this since January and working on it since February. At this time, we’ve put 180 hours into it, and plan on working on it a whole lot more. I’m so excited for Blizzcon this year! I can’t wait to see everyone there!